Hotel Crowne Plaza Antwerp is located near the Antwerp Ring Road, at the exit nr 5, Berchem-Wilrijk. It's become one of the Antwerp landmark buildings that can be easily spotted from the Ring Road. Driving on the E17 follow indications Antwerpen Centrum. Past the Kennedy Tunnel take the second exit Berchem-Wilrijk (nr. 5). The hotel is next to the exit. Follow E19. When entering the tunnel take left track indicated as Centrum. Keep left. Turn left at the second traffic light indicated as Singel-Zuid-Hoboken. Warning : You are entering this road from the right. You have only 150 meters before reaching the next traffic lights where you turn left. Make sure you are on the right of this road by then. The hotel is 400 meters on your right hand side. Driving on the Ring 1 in the direction of Ghent take exit Nr. 5 indicated as Boom-Brussel-Wilrijk. Follow A12 until exit (uitrit) Wilrijk. Keep right. At the traffic light you are in front of the hotel. Around the hotel, there is free parking for approximately 750 cars. 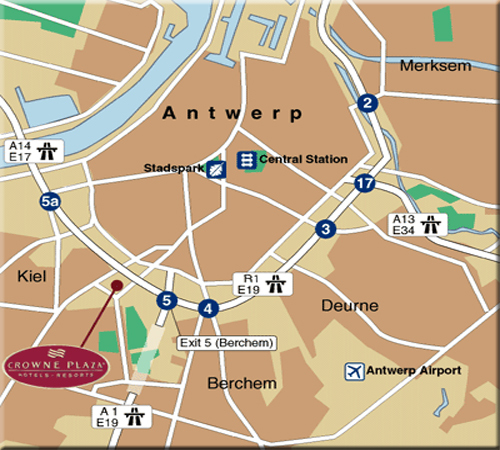 There is a shuttle bus from Brussels Airport to the Antwerp Crowne Plaza hotel every hour on the hour. See time table. If you are looking for accommodation, please contact the Hotel Crowne Plaza directly: call (03) 259 7500 or email reservations@cpantwerp.com.